You are currently browsing articles tagged Orly Airport. Here are RER C train schedules for common routes such as Paris to Chateau Versailles and Orly Airport. 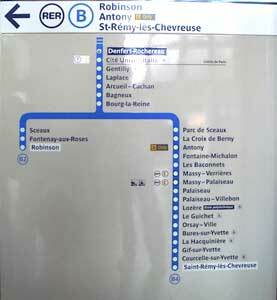 The RER C train is complicated with its 8 different terminus stations (used to denote direction of travel). RER C Schedule – Paris to Versailles (PDF) – If you’re going from central Paris to Chateau Versailles (station Versailles-Rive Gauche), this is your schedule. For weekend or statutory holiday travel, use the weekend RER C schedule (just fewer trains, although the timing is basically the same). At the top of this RER C Timetable is a row for “nom du train“. These specify the train route and can be seen on the front of the train itself as it approaches a station. On the 2nd page with the purple highlighted train schedules, “VICK” designated trains (shown at the first/top row) all travel to Versailles Rive Gauche, the closest station to Chateau Versailles (Versailles Castle & Garden). “SARA” trains do not stop at Versailles Rive Gauche so if you’re looking to visit Chateau Versailles be sure to take VICK trains. This RER C route travels past several central Paris stations (Gare d’Austerlitz, St Michel Notre Dame, Musée d’Orsay, Invalides, Pont de l’Alma, Champ de Mars/Tour Eiffel) on its way to Versailles Rive Gauche station in Versailles, the closest train station to Chateau Versailles. RER C trains making this route will be labeled with direction: “Versailles – Rive Gauche“. Be careful not to confuse this RER C train direction with “Versailles Chantiers – St Quentin en Yvelines”, which does not stop at Versailles – Rive Gauche station. The difference is that Versailles Chantiers station is about 15 minutes walk to the Chateau as opposed to 5 minutes for Versailles Rive Gauche. RER C Schedule – Paris to Orly Airport (ORY) and Massy TGV Station, Monday to Friday (PDF) (Weekend schedule for RER C – Paris/Orly/Massy TGV) This schedule stars from Invalides (Army Musuem) RER C station and travels clockwise through Paris, stopping at Orsay Museum, St Michel, Gare d’Austerlitz amongst other stations before making its way to Aeroport d’Orly shuttle bus station (Pont de Rungis) and ends at Massy TGV train station. 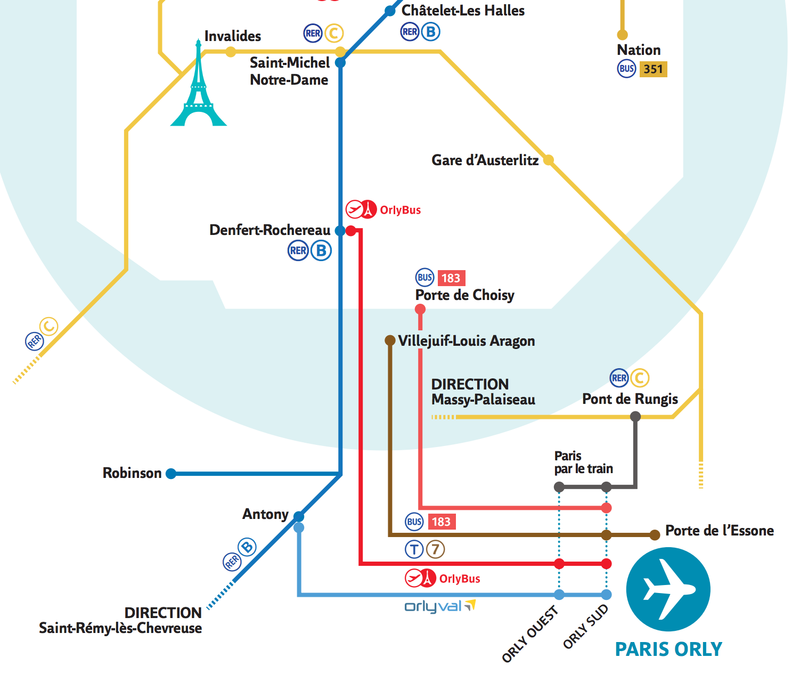 Note that the RER C does not stop directly at Orly Airport but stops at Pont de Rungis where you must transfer to a RATP bus to complete the journey to Orly Airport terminals West and South. RER C trains making this route will be labeled with direction: “Pont de Rungis – Aeroport d’Orly” or “Massy Palaiseau“. The trains will have four letter codes (nom du train) of either ROMI or MONA both on the top of the schedule and on the front of the trains. Getting to Orly Airport (ORY) from Paris using the Orlyval train requires that you first get to Antony station along the RER B train line, then transferring to this dedicated rail line to Orly West (Ouest) and Orly South (Sud) terminals. The RER B train line runs north south, bisecting Paris centrally, connecting both Paris airports Roissy-Charles de Gaulle to the north east and Paris-Orly directly south of the city. Common starting stations for this trip would include Gare du Nord, Chatelet Les Halles, St-Michel Notre Dame, Luxembourg, and Denfert-Rochereau, all located in central Paris and all very accessible by multiple Metro, RER and bus lines. 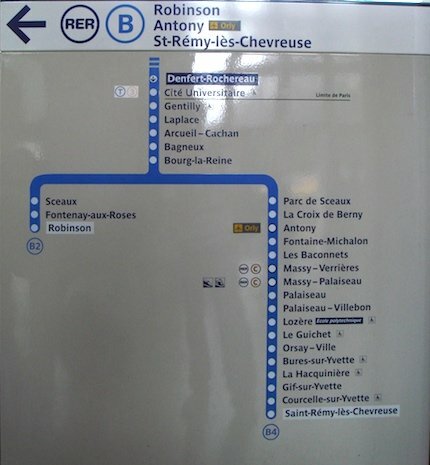 Note that the RER B line (blue line on maps) stops at all of these stations along its route southbound towards Antony. 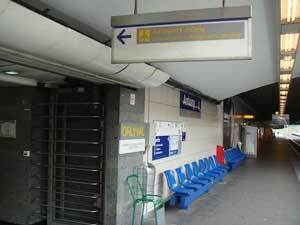 The Orlyval train is ticketed specially requiring an additional fee on top of normal Metro/RER tickets and passes. Purchasing a single one way ticket to Orly airport from any central Paris station will be . Travelers with a 5 zone Paris Visite card can use Orlyval without any additional charges. Passe Navigo users with at least 4 zones can use this pass to get to Antony station on RER B, then transfer at this station, purchasing a special ticket for Orlyval at Antony for . (Yes, this is expensive for an 8 minute ride between Antony and Orly Sud). The first train to Orly from Paris via RER B in direction Antony, Robinson, St-Remy-les-Chevreuse (direction for Orly airport), leaves Gare du Nord at 05:20, Chatelet Les Halles at 05:23, Saint-Michel Notre Dame at 05:25, Luxembourg at 05:27, arriving at Antony at 5:48. 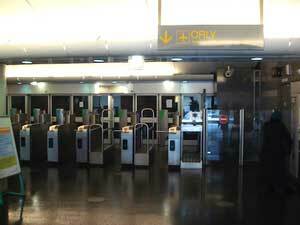 Just enough time to purchase tickets for Orlyval at Antony station, unless you’re using the Paris Visite card. The Orlyval train platform is located at the north end of the Antony station. Thus, when you arrive at Antony via the RER B, walk towards the rear of the train. The Orlyval platform will be on your right hand side near the end of the station. Inside there will be multiple ticket vending machines and a manned ticket kiosk. The first Orlyval train leaves Antony at 06:00, arriving at Orly West at 06:08 and Orly South 2 minutes after that at 06:08. The last trains to Orly from Paris via RER B leave from Gare du Nord at 22:23, Chatelet-Les Halles at 22:26, Saint-Michel-Notre-Dame at 22:28, and Luxembourg at 22:30, arriving at Antony/Orlyval at 22:46. The last Orlyval train leaves Antony at 23:00. Frequent: Orlyval train departs Antony every 4 to 7 minutes. Trains depart RER Stations every 10 minutes on average. Expensive: from any central Paris RER station ( from Antony station). Passes not accepted: Navigo Semaine. (Paris Visite ticket 5 Zone is accepted). 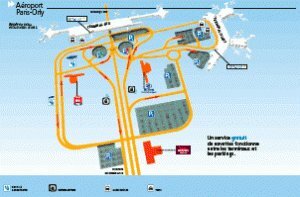 Here is an official map of Orly Airport (ORY) to help guide your way upon arrival. Information on Orly airport bus options.